Foam blank, 1/16'' stringer, Volan laminate, spray decor, post-production right-hand leg rope plug. Thin with light foil on trailing edge. 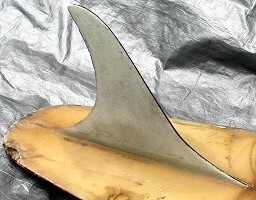 First generation Pat Morgan Keel Fin, circa 1971. Image, with thanks, by Darren Johnston. Deck: Yellow spray (Note the purple rail spray, as illustrated, is not original). Bottom: Clear with mauve, blue and yellow spray decor at sweet spot. Added to the surfresearch.com.au collection, April 2009. The previous owner purchased the board at a local garage sale. CONDITION: 4, extensive rail damage, non-original spray decor, post-production leg rope plug.